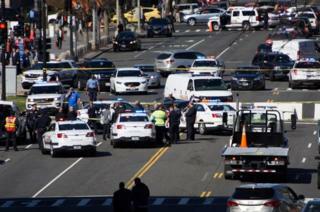 Police in Washington have fired on a woman in a car after she struck a police vehicle near the US Capitol and tried to run over several officers. The woman was not shot, Washington Metropolitan Police spokesperson Rachel Reid told the BBC, and no injuries have been reported. She was taken into custody and the incident prompted a lockdown at one of the Congress buildings. The incident follows driving attacks last week in London and Brussels. But Capitol Police spokeswoman Eva Malecki said the incident was "criminal in nature with no nexus to terrorism". Local media have identified the woman as Taleah Everett, 20. Her aunt, Bonnie Everett, told NBC News that her niece has bipolar disorder, and may have become frustrated by slow-moving traffic. The incident occurred after officers observed an "erratic and aggressive driver" and tried to pull her car over. The driver made a U-turn, nearly striking several officers in the process. Hearings on Capitol Hill are continuing as normal, and tourists have been allowed to return to the area.